The DC budget—our community’s decisions about how to spend our resources—is our central tool for addressing challenges like widening racial inequities in access to affordable housing, quality health care, and educational opportunities. By crafting a budget that strengthens our community, we can ensure that all DC residents have the resources they need to thrive. There are a number of opportunities throughout budget season to voice our values and shape the Fiscal Year (FY) 2020 DC budget. You can—and should—have a say in where our community invests our resources. 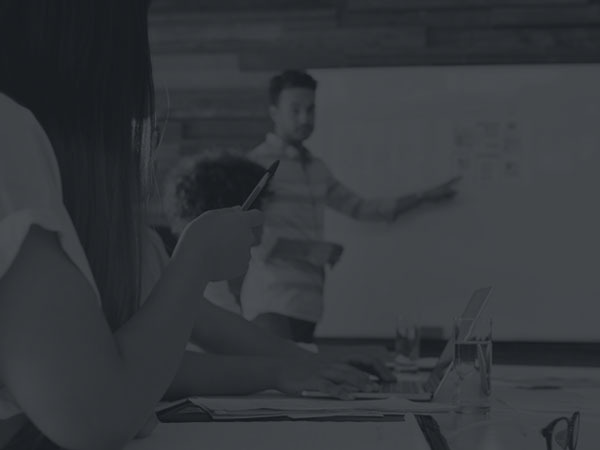 Even though 2019 just started, the process of planning the District’s FY 2020 budget has already begun, and there are opportunities right now for residents to shape the budget for next year. The District’s fiscal year runs from October through September, and the budget process for a given fiscal year starts about a year beforehand. 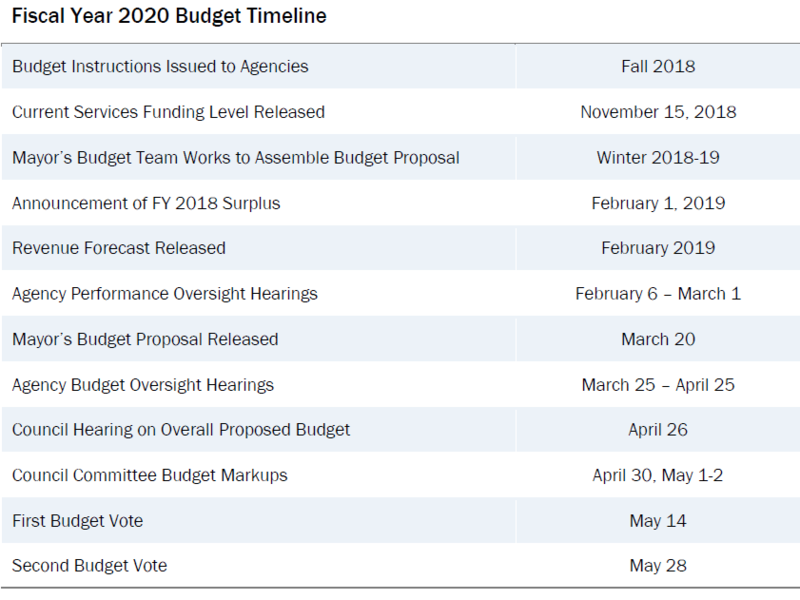 This blog explains the timeline for the FY 2020 budget process. For a deeper dive into the DC budget and tools for getting involved, see A Resident’s Guide to the DC Budget. The Mayor’s budget review team works to assemble the budget proposal and policy decisions about program cuts or increases, and revenue increases. At this time, you can contact the Mayor’s office to make a request for additional funding (or to maintain funding) for a program or services you care about. Most often, this is easiest to do by finding out who is responsible in the City Administrator’s office or in the Mayor’s Office of Budget and Finance for the issue area you are concerned about and meeting with them or sending them a letter or email. You can also attend one of the Mayor’s Budget Engagement Forums, which usually take place in mid- to late February. This is an opportunity to gather with other DC residents and share your priorities with the Mayor before the proposed budget is finalized. More information can be found here. The annual audit of the District’s finances—the Comprehensive Annual Financial Report (CAFR)— will show what the fund balance of the city was at the close of 2018. The balance represents DC’s accumulated monetary assets, including various reserve funds—a mix of federally-required and locally-controlled rainy-day funds to help DC manage its bills. The city’s fund balance has grown substantially in recent years. Read more about how DC used its surplus last year here. In late February, the CFO issues a revenue forecast that includes projected revenues for FY 2020. The budget submitted in March must be balanced. This means that total spending cannot exceed the total revenues from the February forecast, unless the budget also includes provisions to increase revenue. In recent history, forecast revenue has tended to grow from year to year, due to increases in population and economic activity. If there are no increases to taxes or fees, or major cuts to existing programs, this future revenue growth is what will be available for program enhancements or new programs in FY 2020. The Council holds hearings on the FY 2019 performance and spending of every agency. 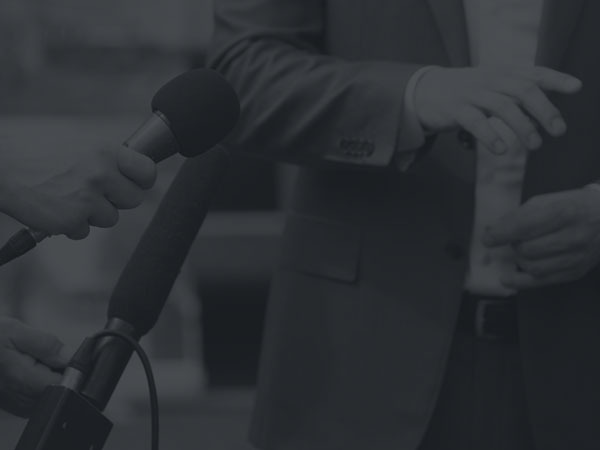 These are free-form open hearings where any member of the public can comment on virtually any aspect of the agency, and where agency heads are questioned by committee chairs and other Councilmembers. 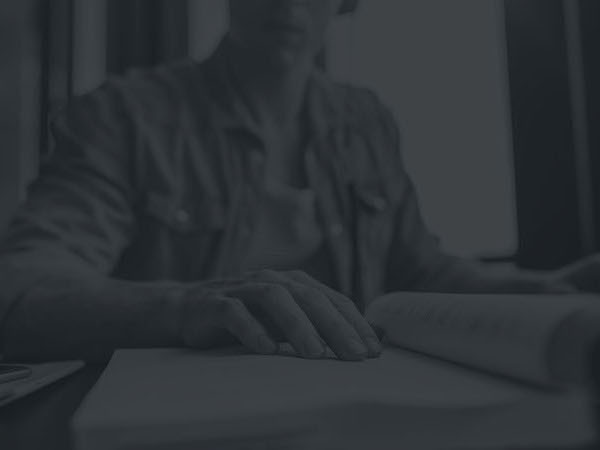 The written questions submitted by committees to the agencies in advance of the hearing, as well as the agencies’ responses, can be found on the Council website. The schedule of performance oversight hearings can be found here. This is a good time to testify on programs and services that you think are working well and help make the case they should be continued or expanded in the upcoming fiscal year. It is also a good time to discuss any changes or improvements you think could be made to the programs and services you care about. The Mayor submits a proposed Budget and Financial Plan, which describes proposed operating funding for all DC government agencies and services, in late March. The Mayor also will submit a proposed capital budget, which is a six-year plan for building and improving government facilities and infrastructure. The budget legislation that reflects proposed funding levels is called the Budget Request Act. The Mayor also submits a Budget Support Act, which includes legislation for any budget proposal that requires a statutory change. The proposed FY 2020 budget and related documents will be posted here on the Chief Financial Officer’s website. Shortly after the budget is submitted, each committee holds hearings on the budgets of the agencies the committee oversees. There are both public witnesses and executive branch witnesses. The schedule for budget oversight hearings, questions regarding agency budgets that are submitted by committees to the agencies, and the agencies’ responses will be posted on the DC Council website. This is a good time to testify on elements of the Mayor’s budget that you do and do not like, especially if things are not included at all. Each year, the full DC Council holds a hearing on the Mayor’s budget proposal shortly after it is released. Video archives of this hearing, along with other hearings, can be found here on the Council’s web site. Each Council committee meets to markup the budgets for the agencies they oversee. The committees cannot appropriate more in total for their agencies than the amount in the Mayor’s proposed budget, but they can shift funds within and between their agencies. Committees can also transfer funds to agencies in other committees, or request and accept the transfer of funds from other committees’ agencies to theirs. The committees can make recommendations for things they were not able to fund but that they hope the full Council will find a way to fund. The committees also adopt recommendations on the Budget Support Act provisions that relate to the committee. After each committee has completed markup, there is a short period during which the Councilmembers work to merge the committee actions into a comprehensive budget. This work happens behind the scenes. There is no markup on the Council’s comprehensive budget. The full Council (Committee of the Whole) votes on the Budget Request Act (BRA), which sets the appropriations level for each agency. There is only one vote on the BRA. Also in May, the Council will hold its first vote of the Budget Support Act (BSA). There is a second vote on the BSA. The Council holds the second vote on the Budget. The federal portion of the budget is then submitted to the U.S. Congress for approval. Budget & Financial Plans, for FY 2019 and prior years, via the Office of the Chief Financial Officer. The Mayor’s proposed FY 2020 budget will appear here on March 20. Resident’s Guide to the DC Budget is a deep dive into the DC Budget, including what the budget funds, how it is put together, and information on how to get involved in shaping the budget. DCFPI Budget Toolkit, which includes budget by issue areas (e.g. child care, education, health), and other helpful resources. 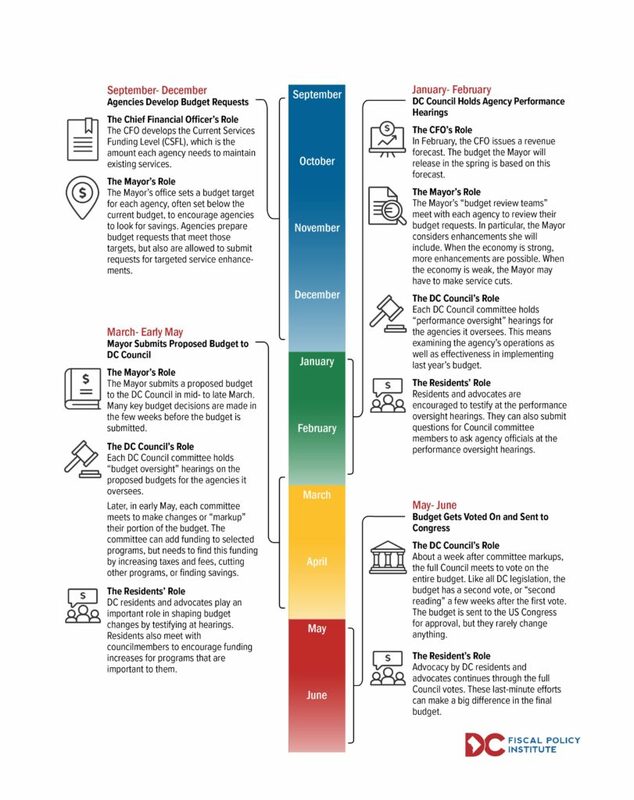 The FY 2020 budget toolkit will be available in early April 2019.